David's Life Care Planning Story | DeLoach, Hofstra & Cavonis, P.A. A Life Care Planning Client Story David worked with Attorney Rep DeLoach and the elder law team at Deloach, Hofstra & Cavonis. Here what he had to say about his experience with our firm. An accident early in life required him to rely on the use of a wheelchair for mobility. Now only in his 60s, his declining physical abilities led him to move to a nursing home. With little space for personal items and no privacy, he lived in a shared room for three years. A family member who worked with Rep DeLoach on their own estate plan referred David to DeLoach, Hofstra & Cavonis, P.A. He engaged Rep for a Life Care Plan (LCP). 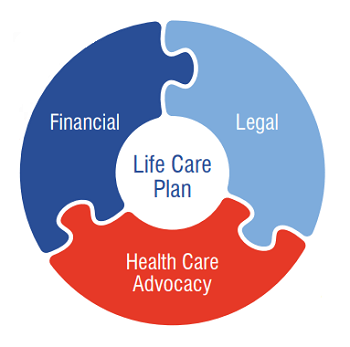 A LCP is a holistic approach to elder law which examines not only the legal and financial aspects of the aging process, but with healthcare advocacy and oversight to help ensure the client receives the care and quality of life they deserve. Rep drafted all of the legal documents necessary to put David’s wishes into place through a power of attorney and other advance directives. He protected David’s assets for his future care while allowing David to remain on Medicaid. Then Elder Care Coordinator Gloria Centonze was assigned to oversee David’s health care and everything began to change. David wanted a private room at a different nursing home. With over 80 nursing homes in Pinellas County that wouldn’t seem too difficult but private rooms are scarce. Gloria’s extensive background in long-term care and her personal knowledge of facilities and staff gave her an advantage. Samantha Vosloo, the Administrator at Palm Garden of Largo, an excellent facility, called to share that a private room would soon be available. When Gloria called David he was ecstatic. In his former facility, David was denied rehabilitation and the opportunity to be self-sufficient. In the new facility, with training from the staff David can now get in and out of his chair unassisted. He loves his new room and private shower, basic necessities we take for granted. He appreciates the quality and variety of his meals so much that he has gained 20 pounds. David says over and over how Gloria changed his life. His new surroundings helped open his world to positive thoughts and actions. With money set aside for his care by Rep’s legal work, David is in a much better place. We strive to provide the best quality of life for every client. A knowledgeable advocate working to find the right place for your loved one can have a powerful impact on their life. When you need help for a loved one, we’ll be here for you.